Last summer Ai Naimiki spent two months in India as part of Tata ISES, an internship programme administered by LSE Careers and the India Observatory. Here she offers insights from her CSR research project and argues that initiatives across India are providing opportunities for entrepreneurs from disadvantaged backgrounds. The power of people at grassroots level – this is what I witnessed throughout my two month stay in India as the first Japanese intern at Tata Communications in Mumbai. I was part of the Tata International Social Entrepreneurship Scheme that was established with the aim of providing selected students from six international universities with internship experience related to Corporate Social Responsibility (CSR) and social entrepreneurship in Tata companies. As an independent consultant for the CSR division, my role was to conduct a social impact assessment of Entrepreneurship Development Programme for the scheduled castes and tribes supported by the company. Specifically, I interviewed 11 individuals who have taken part a range of training to be micro-entrepreneurs provided by Tata over the last year. Sitting in the back of a local shop, or in a candidate’s house having a cup of tea, I heard the stories of the future entrepreneurs which showed their strong will to change their communities. Throughout the challenging days in Mumbai, there were two findings that I gained from participating in the project, which challenged the stereotypes I subconsciously held before I arrived. One is the hidden potential of people at the “base of the pyramid”. The majority of the interviewees that I spoke to in the course of my CSR project were from the low-income communities, which form part of the three billion people in India who live on less than US$2.50 per day. What impressed me deeply was the unlimited ambition, acumen and strong passion for solving daily challenges. Take, for example, an entrepreneur I interviewed named Mahesh. Eight years ago, Mahesh was robbed. This was a serious blow to his family’s finances, and ultimately resulted in them losing most of their property. The family was ignored by the financial support systems. However, with the help of the Entrepreneurship Development Programme (started last year) Mahesh has successfully established his solar-lighting business making the most of his skill of mechanics gained from a former part-time job at a factory and a strong entrepreneurial spirit. As a result, he established financial sustainability and gain social recognition as an influencer in the scheduled caste community to which he belonged. All too often, talented individuals from deprived backgrounds like Mahesh do not get opportunities to test entrepreneurial ideas. This raises the question: whose responsibility is it to create opportunities like this? Is it the responsibility of big international charities who are increasingly involved with more advocacy-related projects? Tata’s CSR initiative suggests the private sector should play a role in maximising management and financial skills in the communities in which Tata companies operate. My second finding is that India is a country full of organisations that offer innovative solutions for realising the potential of economically and socially excluded people. Encouraging entrepreneurship among marginalised communities struck me as a particularly effective way of doing this. 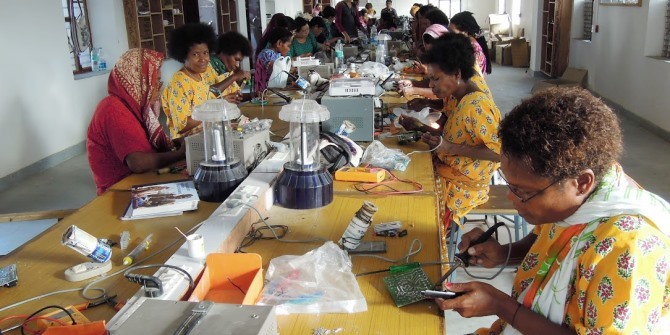 Tata’s CSR initiative has gained a global attention for its innovation in this area. The third sector has also contributed to and strengthened the ‘entrepreneurship movement’ in India. The NGO Barefoot College, based in a small village of Rajasthan, have focused on revealing illiterate women’s potential by training them as solar engineers providing free six month skill-building programmes to encourage them to be community leaders. When I talked with the organiser, he told me “We believe that our trainees are rich in enterprising spirit, highly intelligent, and also remarkably quick learners”. So far, the college’s alumni have provided nearly 200,000 people with solar electricity systems in hundreds of villagers in India since 1972, as well as about 1083 villages in 63 other countries. The Honey Bee Network founded in Ahmedabad is another good example of an organisation providing institutional support for scouting, sustaining and scaling up the grassroots innovations by local ‘innovators’ all around India. They have organised national competitions for grassroots technologies developed by farmers, such as a motorbike that can be converted into a plow and a machine that separates cotton fibre from the rest of the plant. India has the potential lead the rest of the world as a “chance maker” for future entrepreneurs. My time in India was unforgettable and highlighted to me that the power of people at the base of the pyramid was not an illusion but a fact that I was able to witness repeatedly. Ai Namiki has an MSc in Development Management from the LSE. Before coming to the LSE she interned at several social enterprises based in developing countries, including BRAC in Bangladesh and Kopernik in Indonesia. She is now at Deloitte Japan, working as a management consultant aiming to maximise the business potential of developing communities in Asia.